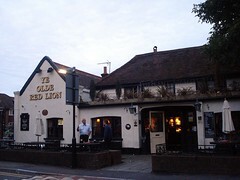 Pub in Cheam. Previously owned by Mitchells & Butlers, it was sold to the Stonegate Pub Company in mid-late 2010 and is now part of their Local Pubs sub-brand. There are a number of separate areas inside, as well as some seating out the front and a fairly big paved beer garden with picnic benches. The decor and atmosphere are fairly traditional. Kake and bob visited on a Saturday afternoon in June 2012. Three real ales were on: Wells Father's Day Ale (£2.95/pint), Hammerpot Pale Ale, and Young's Bitter. Aside from differences in the choice of ale, there didn't seem to have been many changes from our previous visit on a Tuesday evening in October 2010. On both visits there were quite a few people in — groups, couples, and even one or two people who seemed to have come on their own to have their dinner there. Music was playing; a reasonably eclectic combination including The Specials, The Who, and various hits from the '80s. A flatscreen was showing the news with subtitles and no sound on our first visit, and the tennis with no sound on our second visit. The presence of a party with a dog (inside, not in the garden) on our second visit suggests dog-friendliness. Food is served from a fairly standard pub menu (until 9pm daily, according to the menu as of June 2012). Notably, they have a cash machine that doesn't charge for withdrawals. They also have free wifi supplied by The Cloud; you have to give an email address and password to register, but there's no verification of the address and when Kake tried in June 2012 it happily accepted an address previously registered for Cloud wifi in a Wetherspoons. Accessibility: No steps to get in. Step-free to the bar and at least some of the seating once you're in. A shallow ramp to the room at the left of the bar (from which the toilets are accessed). Not sure about access to the beer garden though. Last visited by Kake and bob, June 2012. Opening hours taken from the Red Lion website, June 2012. Last edited 2013-05-10 08:19:49 (version 3; diff). List all versions. Page last edited 2013-05-10 08:19:49 (version 3).